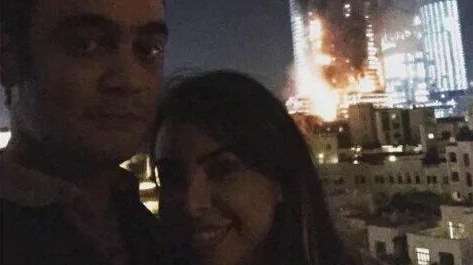 A couple who took a selfie in front of a 63-story luxury hotel in Dubai on New Year’s Eve as it burned in the background is receiving backlash on social media. A fire broke out in the residential building on Thursday, leaving 14 people with minor injuries, Dubai officials said. Firefighters were still working to put out the blaze on New Year’s Day. Instagram user @ar_atiki, identified as AbdulRahman Alateeqi by the New York Post, shared the photo with a caption of New Year’s wishes. The hotel is known for being a perfect viewing spot for Dubai’s New Year’s fireworks display, set off at the nearby Burj Khalifa, the world’s tallest building. The fireworks show went on as the building burned, so some social media users believe the couple may have confused the flames with fireworks while taking their photo. “Inappropriate photo of the day. Couple probably thought it was part of the display,” Twitter user @avibarr tweeted on Thursday. Others aren’t giving the couple the benefit of the doubt. “Yeah, let’s take a selfie where people could be burning to death,” the New York Post says one Instagram user wrote before deleting their comment. Many commenters are hoping Instagram will remove the photo altogether.